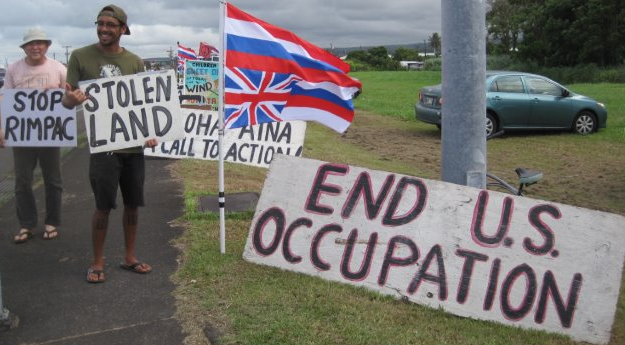 Note: The RIMPAC war games are igniting protests in Hawaii and once again reminding people that Hawaii is stolen land, a nation that the United States took over and illegally made part of the United States. The article below by Jon Olsen focuses on the issue of Hawaiin independence. 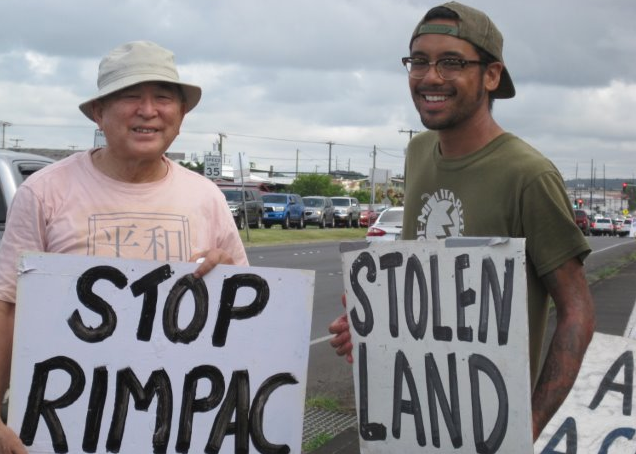 Protests against RIMPAC are re-igniting calls for independence of Hawaii and the reality that it is stolen land. From Jim Albertini. An open letter from Malu ‘Aina: Center for non-violent education and action opposing the RIMPAC war games describes why they are opposed by many Hawaiians and others. China was excluded from RIMPAC this year with DoD spokesperson, Lt. Col. Christopher Logan, explains “[A]s an initial response to China’s continued militarization of the South China Sea….” They seem to have become part of what President Obama called the “Asian Pivot” which has become an encirclement of China which include various military provocations. Not only do people in Hawaii oppose the RIMPAC war games they also want the liberation of Hawaii. From Jim Albertini. A National Liberation — Where? World attention is focused on the long-standing occupation of Palestinian territory by an ever-encroaching Israeli presence which began in 1947. A great deal has been written on this subject and this focus is entirely appropriate. But there is another occupation that has continued for fifty years longer, but which receives scant attention, even among the educated Left. That is the continued occupation of the country called Hawai’i. “Whoa, wait a minute!? The reader will exclaim, “Wasn’t that issue ‘settled’ in 1959 with US statehood?” That’s what the whole world thought, including most Hawaiians, until Hawaiian scholar-activists began to research the legal and historical details. What they discovered is that both by international law and by US Constitutional law, the relation that exists is that of prolonged occupation and that the claim to “annexation,” the foundation of the “statehood” claim has no validity whatsoever. Rather, control, but not sovereignty, passed to the US. in 1898, and that sovereignty has remained dormant, like the giant volcano Haleakala on Maui. Hawai’i had been long recognized as an independent country during the 1800s, including having embassies and consulates all over the world, and this included the United States. The actual two-stage coup against the established monarchy in Hawai’i started in 1887 with the imposition of the “Bayonet Constitution,” by way of threats of assassination of King David Kalakaua by proponents of the business interests of the Caucasian elite, mostly descendants of the original missionaries who began arriving in 1820 to “civilize” the Hawaiians, despite their having an advanced civilization and a healthy, thriving population prior to the first arrival of Caucasian explorers in 1778 in the form of ships of Capt. James Cook of England. The “Bayonet Constitution” emasculated the powers of the king, reducing him to little more than a figurehead, but this imposed Constitution was not confirmed by the Hawaiian legislative body as it represented only a tiny but influential portion of the population. The second stage of the coup happened on January 17, 1893 against the sister ofKing Kalakaua, Queen Lilifuokalani, who had succeeded] her brother upon the death of the king (poisoning rumors remain) in 1891. She was highly educated, fluent and eloquent in both Hawaiian and English, a composer of music, compassionate, and greatly beloved by her people. The population had been clamoring for a repudiation of the Bayonet Constitution and the promulgation of a new one, supplanting the last legitimate one of 1864 in view of new developments. While contemplating this, the coup against her government was hatched by the same forces of 1887, with the important additional component of avid annexationist John Stevens, who was acting in the capacity as Minister to Hawai’i (what we would now call Ambassador.) Collaborating with those few Caucasian business people and political figures in Hawai’i, he arranged for 160 armed men from the USS Boston to land and set up a formation facing Iolani Palace, the home of the queen and the site of government. The coup plotters insisted that she surrender and accept the “provisional government” or face violent retribution against her and any who would resist. If it had been only the local conspirators, her government could have put down this insurgency, but she was not willing, understandably, to take on the US. military power and inevitable loss of life. In Chapter 9 of Liberate Hawai’i, I examine in detail the parallel case of Lithuania which regained its sovereignty after 50 years of parallel alleged “annexation” by the U.S.S.R., an action which is now receiving “blowback,” by allowing U.S. bases on its territory and threatening Russia at the present time. Condensing history, this protest was received by the incoming president, Grover Cleveland and who, receiving two entirely different accounts of what had transpired sent a personal representative to investigate and meanwhile withdrawing from Congress the purported Treaty of Annexation until he received the report, which was honestly and methodically carried out, and which fully vindicated the queen’s position. In a major speech to Congress in December of 1893, he roundly denounced the coup, calling it, among other things, “an act of war.” This coup was the first of many subsequent regime changes orchestrated by the U.S. Empire. In fact, once can say that 1898 was the year in which the U.S. ceased to be a nation and became an empire, grabbing as well, the Philippines, Guam, Puerto Rico, and Cuba. Apparently lacking Congressional authority, Cleveland did not use military force to reinstate the queen, so a 4-year stalemate ensued, as the conspirators would not reverse course. With the 1897 inauguration of William McKinley, the “annexation treaty” was once again introduced, but opposition by some in Congress and massive resistance by Hawaiians, involving the “Monster Petition” of tens of thousands, culminating in a visit to Washington, DC by Queen Lili’uokalani, prevented the required 2/3 majority, so the “Treaty of Annexation” spoken of in history books failed! There was no passage of such. What the proponents then proposed was a “joint resolution of Congress” in its place, but clearly Congress has no authority to annex a foreign country, particularly one in which there was no plebiscite which would have overwhelmingly failed. Imagine, for instance the ridicule that would occur if Congress today unilaterally claimed to annex Denmark without consulting the Danes! Further, one of the parties–the alleged “Republic of Hawai’I” was illegitimate, as declared so by none other than President Cleveland himself! Yet it is this domestic legislation which serves even today as the basis of the claim to have acquired Hawai’i! As with the case of magician who “apparently” converts colored ribbons in a hat to a live bird (an optical illusion), this so-called “annexation” of Hawai’i was a historical illusion. Yet it is this illusory foundation on which the “statehood?” plebiscite of 1959 occurred, sixty years later after intense anti-Hawaiian government propaganda, mandatory use of English, and a systematic educational erasure of this vital history for the next century, now being “excavated,” as it were, by diligent Hawaiian scholars. At the present time, there exists in Hawai’i a broad and deep movement, led by Native Hawaiians, to activate the dormant sovereignty that never was extinguished. Control, not sovereignty, was transferred in 1898, as likewise happened in Lithuania in 1940. Further, examples of war crimes are being asserted in occupied Hawai’i, e.g. conscription of Hawaiians into US. Military service over decades, pillaging of property etc. This movement is educational, diplomatic and political in its nature, but because there is no resort to armed conflict, media ignore it. So has the Left. It is up to us who understand the matter to raise it and to support that effort, not as mere cheerleaders but as allies. Liliuokalani. Hawaii’s Story by Hawaii’s Queen. Honolulu, Hawaii: Mutual Publishing. Fifth Printing, June 1999. (Reprint of original 1898 edition). 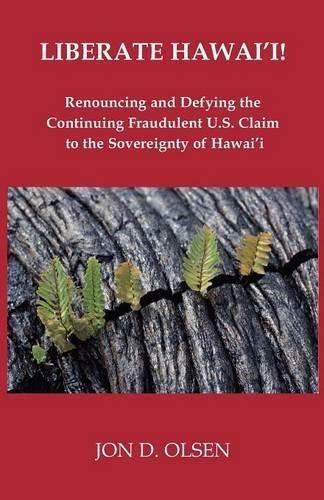 Olsen, Jon D. Liberate Hawai Renouncing and Defying the Continuing Fraudulent U.S. Claim to the Sovereignty of Hawai’i Waldoboro, Maine: Goose River Press. 2014. I S R A E L (Israhell, the racist/apartheid Zionist entity so-called Israel) is one of the “26” involved in RIMPAC 2018???!!!!! Aarghhh!! !